formerly a subterranean temple on an unnamed planetoid. Powers: Ganymede is a highly adept combatant, possessing (presumably) enhanced human to Class 10 strength, with superhuman speed, durability, agility, reflexes, etc. She is proficient in the use of her staff as a bo. She can survive unaided in space, and her belt allows her to fly and navigate at great speeds. She can unleash blasts of great power from her staff. (Silver Surfer III#80 (fb)) - Ganymede is one of the Spinsterhood who battled Tyrant in the distant past. (Cosmic Powers Unlimited#3 (fb)-BTS) - Ganymede entered the Spinsterhood as a cadet alongside Persephone, and the two soon developed a fierce rivalry. Persephone attained a higher rank or level of skill, indicated by the triple stripes which adorn her face. (Silver Surfer III#81 (fb) - BTS) - Tyrant was defeated by Galactus in the distant past. The order of the Spinsterhood dispersed themselves throughout the universe, entering suspended animation within stasis chambers in seeming space debris--waiting for the return of Tyrant. BTS - The stasis chambers of the Spinsterhood were destroyed, killing the warriors within them. Only one survived--Ganymede. (Silver Surfer III#80) - The computer awoke Ganymede from suspended animation to continue the struggle against Tyrant. She suited up and did a refresher training sequence. In pursuit of Ganymede, she observed the Silver Surfer, who had stumbled upon Morg's axe after agents of Tyrant had abducted him and Terrax. Ganymede stumbled upon the Surfer, mistook him for an agent of Tyrant, and engaged him in battle. (Silver Surfer III#81) - The Surfer convinced Ganymede that he had no affiliation with Tyrant. She explained her origin, and how she had surmised that she was the only surviving member of her order. (She held the conviction that the hibernation chambers of the other Spinsters were destroyed in accidents or just stopped working, since none of them showed up.) The Surfer and Ganymede went to Fortress, Tyrant's old base of operations. There Tyrant's Heavy Troopers ("a few simple, organic functions housed inside metal hulls") confronted them. They defeated them easily, but Tyrant himself got the drop on them. They awoke to find themselves imprisoned alongside Gladiator, Beta Ray Bill, Terrax, and Morg. Tyrant revealed that he intended to use them all as living power batteries to boost the energy of his soldiers. 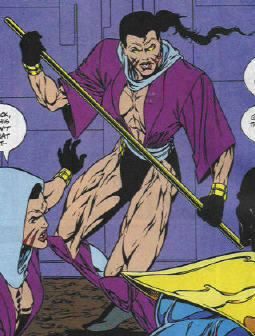 (Silver Surfer III#82) - Tyrant's minions brought a captured Jack of Hearts to join the other prisoners. Jack of Hearts refused to remain prisoner, and gave off a spectacular burst of energy that seemed to have killed him. It freed the others, who engaged Tyrant's soldiers. Ganymede went to search for Jack of Hearts, shaken but still breathing. A Tyrant lackey attacked her as she felt for life signs on Jack of Hearts, but Ganymede destroyed the pawn. More arrived, so the Surfer directed Ganymede to concentrate on getting Jack of Hearts away. Morg foolishly then decided to attack Terrax, resuming an old grudge. Ganymede chastised them for their short-sighted anger. Beta Ray Bill, Gladiator, and the Surfer flew over to attack Tyrant himself, who repelled them, but their attack gave Ganymede the chance to sneak up on him and get in a good offensive. 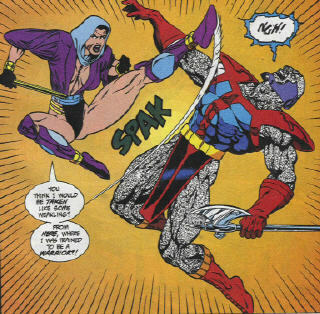 Tyrant injured her, and then defeated the Surfer. However, Galactus then arrived in search of Morg. Tyrant and Galactus had traded blows in the distant past. Not wanting to start a battle with Tyrant that would cause undesirable damage, Galactus negotiated with him, allowing him to have Morg. The others left, with Ganymede tending to Jack of Hearts. (Silver Surfer Annual#6/3) - Ganymede took Jack of Hearts to a deserted planet that the Spinsterhood had used as a retreat from their conflict with Tyrant. She told him that she could release herself from her vows now that Tyrant had again fled, and they prepared to get hot and heavy. However, the two were then attacked by a remnant of Tyrant's army. It attacked them, but Ganymede destroyed it. She realized she could not relinquish her vows until Tyrant was destroyed...and she left Jack blue...costumed. 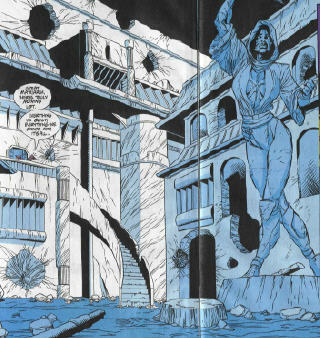 (Cosmic Powers#3) - Ganymede led Jack to the former base of the Spinsterhood. After deactivating the android guard, she proceeded inside and checked all of the remaining stasis modules, and found that every last one of the other Spinsters had died. Suddenly, they were approached by Thanos and Terrax, who sought Ganymede's aid against Tyrant, for their own agenda. Not bothering to explain their reasons, the two simply attacked their targets. Ganymede succeeded in overpowering Terrax, but Thanos defeated Jack and then Ganymede, and he and Terrax abducted her and left. (Cosmic Powers#4) - Ganymede refused to assist Thanos, despite his threats and promised to terminate her if she did not acquiesce. (Cosmic Powers#5) - Thanos, with Terrax's aid, kept Ganymede prisoner. Thanos informed her that he had her abducted so as to gain crucial information about Tyrant, whom Galactus sought to defeat. Seeing they had a common purpose, Ganymede agreed to help Thanos, who asked Terrax to release her from her restraints. Ganymede joined them as they breached Tyrant's base of operations. They defeated Tyrant's usual guards, but a brainwashed Morg then attacked them. However, Terrax (whom Morg still had a grudge against) managed to free Morg of the brainwashing. Morg departed to return to Galactus as Jack of Hearts and Legacy (Genis-Vell) arrived. Jack of Hearts attacked Thanos, who easily repulsed the attack. Ganymede informed Jack of Hearts to desist in attacking Thanos, as they needed him to stop Tyrant. (Cosmic Powers#6) - One-by-One, Tyrant overpowered his attackers, as Thanos had abandoned them to seek an object of power. By the time Thanos returned, Ganymede was the last of Tyrant's opponents still standing. Thanos made it clear that he had no interest in assisting any of them, at which point Ganymede attacked him for his betrayal--and Thanos blasted her into unconsciousness. Thanos then attacked Tyrant, and as the others recovered consciousness, they decided to leave Thanos to his fate. They stole his ship and fled. After proving he could withstand Tyrant's attacks--although he was clearly on the losing end, Thanos stole one of Tyrant's power spheres and teleported away. (Cosmic Powers Unlimited#3) - On a small moon of Jupiter, Ganymede and Jack of Hearts practiced the fighting skills, and Ganymede found the strength of her convictions in her vows weakening. As she let her self fall in love with Jack, she was blasted in mid-lip lock by Persephone, another of the Spinsters, who chastised her for betraying her vows. Ganymede and Persephone renewed their rivalry, but after a short fight they were contacted by Jakar, who revealed that he had re-created (cloned?) Persephone in order to oppose Tyrant. Ganymede and Jack joined Persephone in assaulting Tyrants' Fortress, but after they had stolen one of Tyrant's Globes of Power, Jakar sent them back to the Jovian moon, keeping the Globe for his own purposes. 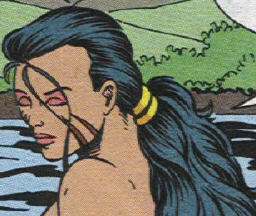 Persephone convinced Ganymede to break off her relationship with Jack, and to return to training to bring down Tyrant. (CPU#3/2) - Tyrant apparently met his end (Silver Surfer III#109), but Ganymede and Persephone continued to search for him throughout the Universe, chasing clues falsely planted by Jakar (who was actually sending them to track down the final pieces of his new Globe). The two Spinsters followed that trail into the frigid wastelands of the Jubat system where they slew a pair of alien creatures that attacked them. 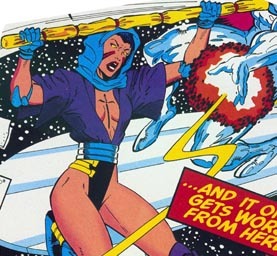 The Silver Surfer admitted that before he met Ganymede, he had never heard of Tyrant. Galactus, however, had met Tyrant and traded blows with him in the past. Actually, Galactus created Tyrant, although the two became mortal enemies. Ganymede and Jack were both still unconscious when the decision to leave the fight was made. It was Genis and Terrax who took them and left. I'd guess Ganymede was pretty P.O'd when she woke up. Spinster is an archaic term and refers to an unmarried woman, especially one past the common age of marriage, and who seems unlikely to marry. By Per Degaton and Snood. GANYMEDE - Olympian myth, Zeus favorite cup bearer--not yet seen in the Marvel Universe. (Silver Surfer III#80 (fb)) "When the universe was young", the order of the Spinsterhood flourished. These women took sacred vows, forfeiting carnal pleasure to learn combat. 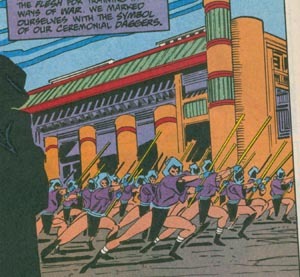 They marked themselves with the symbol of the ceremonial dagger. They gained eminent expertise with their energy staffs and flight belts. They engaged the powerful malcontent Tyrant in a war that took place over centuries amongst many galaxies. They eventually drove him to uncharted space. Unable to think of anything else to do upon the defeat of Tyrant, the Spinsterhood elected to retire to various hibernation chambers disguised as space rock. They would wait till Tyrant returned. After a few billion years, he did. However, over the billions of years in stasis, all of the Spinsters, with the exception of Ganymede, perished. (Cosmic Powers#3) - Ganymede confirmed the deaths of all of the Spinsters in stasis within their former base. (Cosmic Powers Unlimited#3) - Another of the Spinsters, Persephone, was cloned by Jakar. After fulfilling a false mission for Jakar, she joined with Ganymede in renewing their mission against Tyrant. It is unclear whether they have yet learned that Tyrant met his apparent demise at the hands of others. Their former temple exists in ruins beneath the surface of an unnamed planetoid, guarded by a powerful android duplicate of one of the Spinsters. The android can be deactivated by a simple touch of a button on the back of its neck.